Humanity stands at the edge of an abyss. We have destroyed the planet ,its biodiversity, water and the climate, and through this destruction, the ecological context for our survival as a species. Ecological destruction and resource grab are generating conflicts, which are being accelerated into full blown wars and violence. A context of fear and hate is overtaking the human imagination. We need to sow the seeds of peace -peace with the earth and each other, and in so doing, create hope for our future – as one humanity and as part of one Earth community. 1. We commit ourselves to protect our soils and biodiversity, as in living soil lies the prosperity and security of civilization. 2. 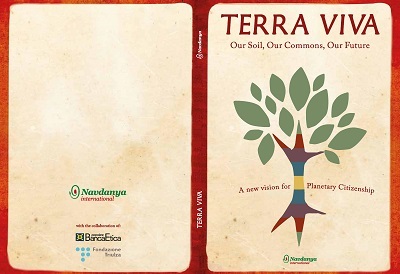 Our seeds and biodiversity, our soils and water, our air, atmosphere and climate are a commons. We do not accept the enclosure and privatization of our commons. We will reclaim them through care, cooperation and solidarity. 3. Seed Freedom and Biodiversity is the foundation of Food Freedom and Climate Resilience. We commit ourselves to defending seed freedom as the freedom of diverse species to evolve, in integrity, self-organization and diversity. 4. We do not accept Industrial Agriculture as a solution to the climate crisis and hunger. We do not recognize false solutions to climate change such as geo engineering, “climate smart” agriculture, genetic engineered “improved” seeds, or “sustainable intensification”. 5. We commit ourselves to practice and protect small-scale ecological agriculture and we will support and create local food systems as these can feed the world while cooling the planet. 6. We do not accept new ‘free’ trade agreements which are based on corporate rights and corporate personhood. Corporations are legal entities to whom society gives permission to exist within limits of social, ecological, and ethical responsibility. Corporations having responsibility for climate change are subject to the Polluter Pays Principle. 7. Local living economies protect the earth, create meaningful work and provide for our needs and wellbeing. We will not participate in production and consumption systems, including industrial food and agriculture, that destroy the Earth’s ecological processes, her soils and biodiversity and displace and uproot millions from the land. 8. We commit ourselves to creating participatory living democracies and resist all attempts to hijack our democracies through powerful interests. We will organize on the principles of sharing, inclusion, diversity and the duty to care for the Planet and each other. 9. We make a pact to live consciously as Earth Citizens recognizing that the Earth Community includes all species and all peoples in their rich and vibrant diversity. 10. We will plant gardens of hope everywhere, and sow the seeds of change towards a new Planetary Citizenship and for a new Earth Democracy based on justice, dignity, sustainability and peace. This pact was initiated on 9 November 2015 by planting a Garden of Hope in the Jardin Marcotte in Paris, together with Navdanya, Solidarité, AMAP Ile de France Network, the Cultures en Herbes, and the Mayor of Paris 11. Four days later, this was one of the locations of the brutal attacks of 13 November, putting into sharp contrast the two possible futures for humanity – one of violence, destruction, hate and fear, and the other of peace, creativity, love, and determination to reclaim our common humanity. 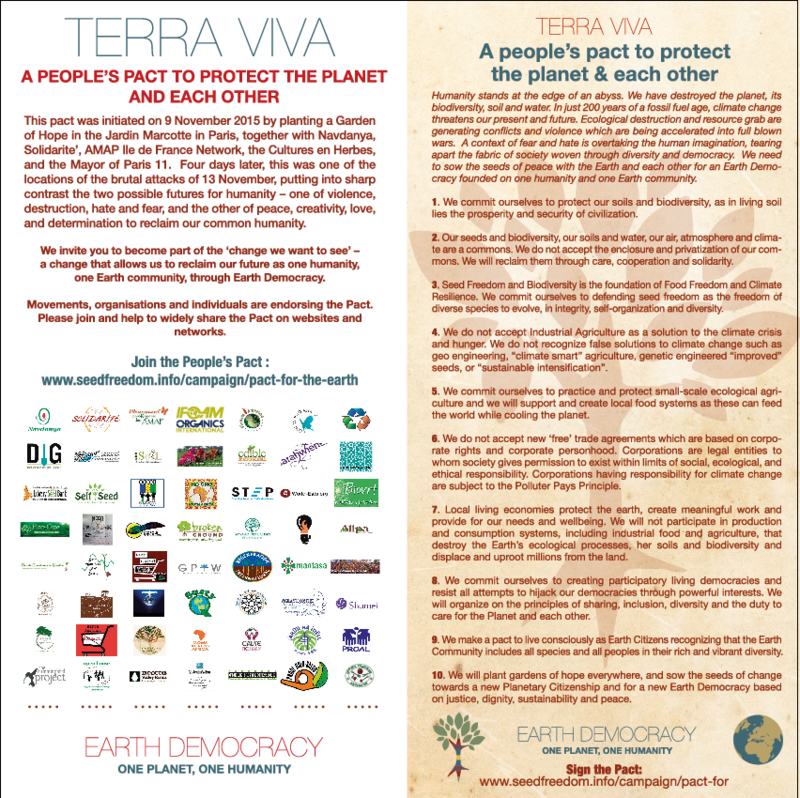 Movements, organisations and individuals are endorsing the Pact. Please join and help to widely share the Pact on websites and networks. On the afternoon of World Soil Day – December 5, 2015 – on the occasion of COP21, leaders in defense of life and of our Planet, representatives of Seed Savers – Community Supported Agriculture Networks, spiritual leaders, artists and concerned citizens gathered at La Villette in Paris and planted a ‘Garden of Hope’ as a reminder that our seeds, our soils and our biodiversity, kept in the hands of local farmers and caring citizens, are solutions to climate change, to which Industrial globalised agriculture makes a significant contribution. Our Seed Freedom and Food Freedom are the keystones to a prosperous and secure future for our Earth and for humanity. As Earth citizens, we launched a Pact with the Earth and with each other to defend our commons – our seeds, soil, water, biodiversity, air and climate systems – essential to building climatic resilience, and to affirm that in ecological organic agriculture and local food systems lie the answers to the food, nutrition and health crisis, water and climate crisis, and the creation of millions of climate refugees. 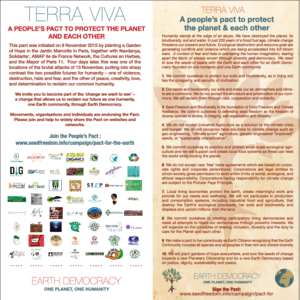 We invite you to become part of the ‘change we want to see’ a change that allows us to reclaim our future as one humanity, one Earth community, through Earth Democracy.